As President Barack Obama addressed the nation regarding national cyber security efforts, hackers claiming to represent the Islamic State (IS) took over the Twitter account of the Pentagon division in charge of the Middle East. Hackers with the Islamic State, also known as ISIS or ISIL, posted links on U.S. Central Command’s official Twitter page to what it claimed was "confidential data from your mobile devices." "ISIS is already here, we are in your PCs, in each military base. 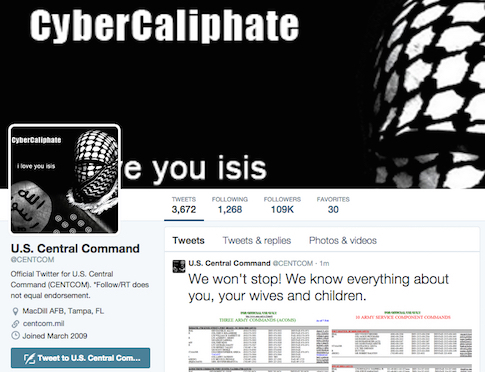 With Allah’s permission we are in CENTCOM now," said one tweet sent from CENTCOM’s account. The apparent hack came as President Obama addressed the nation regarding cyber security. He is expected to propose two pieces of cyber security legislation and to address the effort in his upcoming State of the Union address. The hackers subsequently tweeted images of spreadsheets containing the home addresses, phone numbers, and email addresses of dozens of current and former senior U.S. military officers. "AMERICAN SOLDIERS, WE ARE COMING WATCH YOUR BACK," one tweet stated. 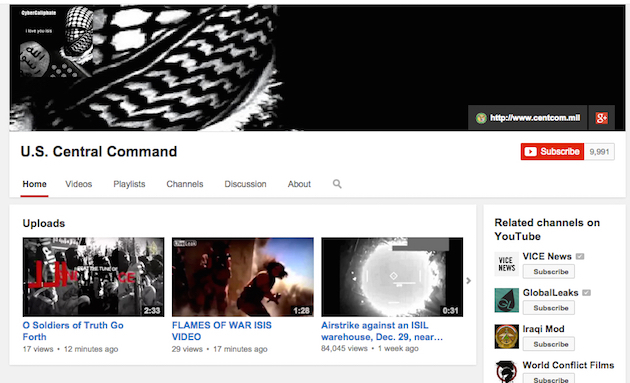 Hackers appear to have also compromised CENTCOM's official YouTube page, where they posted a pair of IS propaganda videos. This entry was posted in National Security and tagged Cyber Security, Islamic State. Bookmark the permalink.